Gujo Hachiman"- Little Kyoto" SUBPAGE | All Japan Kyoto Association"
Gujo Hachiman is widely known as a Town of Dance and Water. It is located almost at the center of Gifu Prefecture with an area of 242.31 square kilometers and over 17,000 people. The serene Nagara River merges with the Yoshida River around the town center. 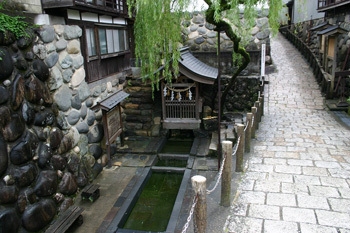 Gujo Hachiman was developed as a castle town along the Yoshida River. Summer is the time for Gujo Odori Dance which is one of the three largest folk dances in Japan. 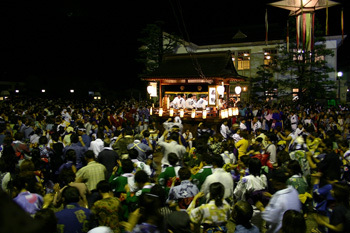 As many as 50,000 people all dance together throughout the night of the Obon (mid-August). The origin of Gujo Hachiman Castle was a fort constructed by the samurai lord, Morikazu Endo, in 1559. Afterwards, the Inaba and Endo Clans expended a lot of effort to maintain the fort and in 1667 the 6th-generation castle master, Tsunemoto Endo, undertook a huge renovation. Finally, the Tokugawa shogunate admitted it as an official castle. The Inoue and Kanamori Clans came and settled in the castle in later years. In 1755, a large riot of farmers broke out and the castle master at that time, the 12th-generation master Yorikane Kanamori, was pushed to resign. It is recorded as one of the largest and worst farmer’s riot in the history of Japan. After the riot in 1759, a new lord, Yoshimichi Aoyama, from Miyazu in the Tango region of Kyoto Prefecture, settled in the region in place of the Kanamori Clan and built his residence on the main street of the castle town. 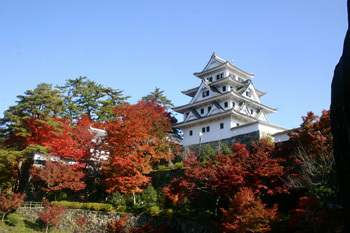 The former Ninomaru buildings of the castle were renamed as Sakura-no-maru and Matsu-no-maru. 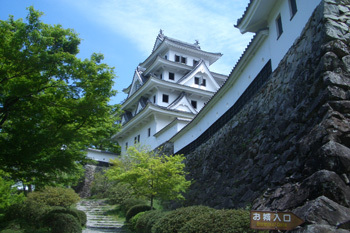 The abolition of feudal domains and the beginning of the establishment of prefectures occurred from 1871 and marked the end of the castle’s history. All of its structures, except for the stone walls, were destroyed. Today, all the stone walls are designated as the historical site of Gifu Prefecture and the restored castle keep is a Tangible Cultural property. A famous Japanese writer, Ryotaro Shiba, praised Gujo Hachiman Castle as the most beautiful castle located on a mountain in Japan. 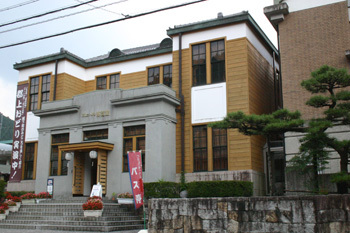 The building was built in the Taisho period (1912-1926) and was used as a former tax office. Keeping its historical atmosphere, it welcomes visitors as a museum today where people can learn about history, tradition, the water environment and Gujo Odori Dance under the theme of “The Hometown of Water, Dance and People’s Heart.” Gujo Odori Dance performance is held four times a day (11:00, 13:00, 14:00, 15:00). A convenient public space for tourists visiting Gujo Hachiman. Enjoy a nice view of the Yoshida River from Shinbashi Bridge while taking a break during your exploration. 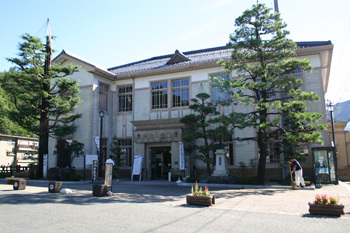 The building used to be the Town Hall of Gujo Hachiman and is designated as a National Cultural Property. Inside displays local specialties and crafts as well as a café “KOBIRI Dokoro” which serves light meals using items from the town. 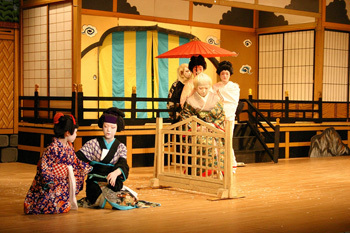 On the second floor, there is an experience hall “KAWASAKI Hall” where people can enjoy Gujo Hachiman Dance. 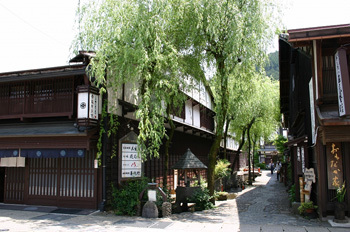 Gujo Hachiman Tourism Association is also located here, so tourists can get all kinds of information about the town such as seasonal recommendations, major highlights of the town and must-try food. The friendly staff will introduce the town with their local dialect. Sogisui is a natural spring which was selected first by the former Minister of Environment as the Best 100 Spring Water in Japan. It is said that Sogi Iio, the grand master of Japanese poetry, received the important poetry lesson from his master, Tsuneyori Tou (who was also a governor of Gujo) at this place in 1471. The two masters of Japanese poetry composed some excellent poems by the spring. Taking a single turn from a bustling main street and walking into this little lane will soothe your heart with its beautiful gravel-covered road (using about 80,000 natural gravel stones from the Nagara and Yoshida Rivers; the number is associating with the name of the town, Gujo Hachiman, which includes the number “eight” in its name in Japanese), a water canal, swaying willow trees and a massive samurai residence. There are three must-visit local museums along the street: Omodakaya Folk Art Museum, Saito Museum and Yudokan Museum. 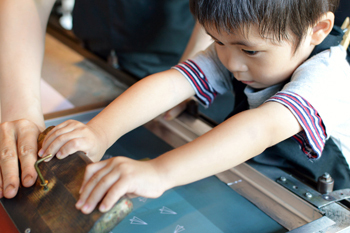 The three museums are called the Yanaka Sankan Three Museums collectively. 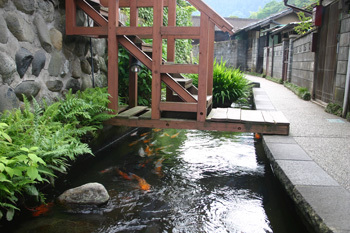 By the Former Gujo Hachiman Town Hall Memorial Museum, there is a pretty small canal where Koi carp and fish swim happily. The canal runs through the town, just behind the private houses, and is where one can find a basket in the water with ayu sweet fish kept inside in summer. There is also an old washing place where local housewives come together and do washing while enjoy chatting with each other. Gujo Honzome is a traditional indigo dyeing process from the town developed by a craftsman, Shokichi Watanabe. The superb color of indigo is called and praised as “Japan Blue” internationally. 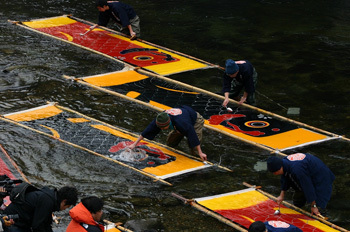 On the day of Daikan (around January 20), Koi-nobori (a large koi carp streamer made with fabric) dyed with the Kachin-zome technique will “swim” in the Yoshida River. Gujo Honzome is enjoyed not only as Koi-nobori but also as tapestry, casual table center, coaster, and for many more items. “When leaving Gujo Hachian Town, my sleeves were wet even though I wasn’t caught in the rain (people enjoy Gujo Hachiman Dance so hard that they get very sweaty but don’t notice it).” This is a lyric from a famous song about the Gujo Hachiman Dance which people have been familiar with for 400 years. Originally, the local samurai governor encouraged the Bon Odori dance in summer in order to establish friendship among the people in his domain. Of course, tourists are welcome to join the dance as the Gujo Hachiman Dance is a dance not for watching but for joining. The long period of dancing starts from mid-July and continues to early September; a total of 33 nights. Every night somewhere in the town, people enjoy dancing. There are 10 different songs for dance, from slow tempo to fast, which people of all ages can join and enjoy together. About 300,000 tourists join the dance every year from around Japan. Gorgeous fireworks displayed near the castle keep of Gujo Hachiman Castle which can be viewed from almost anywhere in the town. 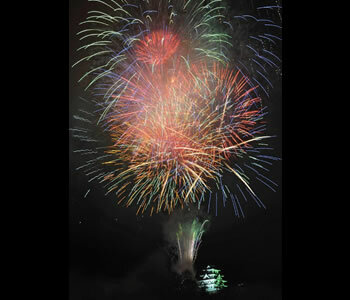 Some tricky fireworks will entertain the audience by the Yoshida River. The color contrast between the white castle keep surrounded by red maple leaves offers a stunning view. 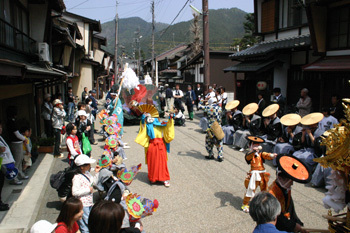 Many fun events are scheduled during the festival period. At the Jokamachi Plaza, shops selling a variety of local food and items from Gujo Hachiman will be opened. A large spring festival held on the third Saturday and Sunday in April every year. The Dai Kagura (traditional court dance and music performance) at three shrines in the city (Kitsurugi Shrine, Hiyoshi Shrine, Hachiman Shrine) is a must-see. Children’s mikoshi portable shrine competition is also fun to watch. The Nagara River has been claimed one of the most beautiful rivers in Japan. 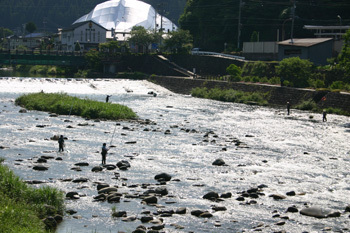 The Yoshida River is a branch of Nagara River and is known as the best fishing spot for ayu sweet fish. 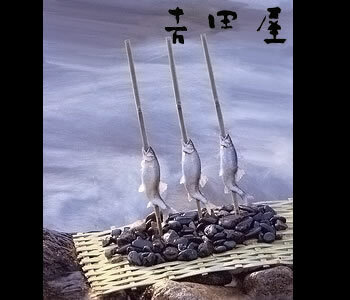 Gujo Ayu are recognized as the best ayu in Japan. At Takao Shrine in the Ichishima district of Hachiman Town, an annual Takao Kabuki show performed by the local people is dedicated to the deity every year. In earlier times, around the late 1950s to early 1960s, there were still some other places where Kabuki by local people (non-professional actors) existed but now this is the only one still remaining. In this area, people have long worshipped the mountains of Hakusan as the deity in the nature since ancient times. “First, the Okaiko Festival in Nagataki and second, the Amazake Festival in Chitora.” This is what people have said in this region and as it claims, this Amazake (Sweet Sake) Festival is just magnificent. 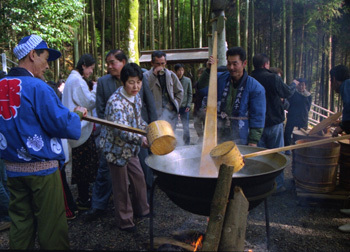 A large portion (about 108 liters) of sweet cloudy sake is boiled in a large pot in front of the shrine hall and local people come and sip a cup of sake one by one as their name is called out. When everyone finishes drinking, they roar together and surround the pot and finish all the sake left in the pot. Such a unique festival. Since olden times, weaving fabric was a popular side job in farmer’s families in Gujo Hachiman. A historical story says that members of the defeated Heike Clan fled to this region and started to produce fabric using wild silkworms. They dyed the silk with natural wild plants and sold the fabric to make a living. Sadly, the tradition was almost extinct after the Meiji period, however, a man named Rikizo Munehiro, made tremendous effort to revive it and it made a comeback as a local craft today. 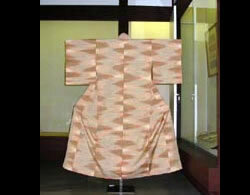 The master technique of Gujo Honzome dyeing has been passed on by the Watanabe Family since the late 16th century. After 430 years, they still follow traditional dyeing methods using wild plants in the field and dye arm and leg guards and work clothes for farmers. In the traditional town of Gujo Hachiman, Watanabe Somemono-ten still opens its door on the Tatemachi Street. The present master, Shokichi Watanabe succeeded the name of the 14th-generation grand master, Yasuhei Hishiya. He is the one and only craftsman who preserves the traditional skills of authentic Japanese aizome indigo dyeing in Japan. Silkscreen printing techniques in Japan were born in Gujo Hachiman. It has been one of the most important local industries of the city and many companies produce excellent printing items. 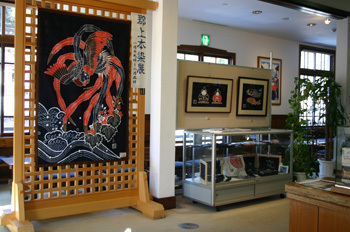 At Takara Gallery Workroom, visitors can try making a tenugui cotton towel with screen printing which is an essential item for the Gujo Hachiman Dance. Designs and colors vary depending on the season, so you can make only one tenugui for yourself which will be a good memory from Gujo Hachiman. 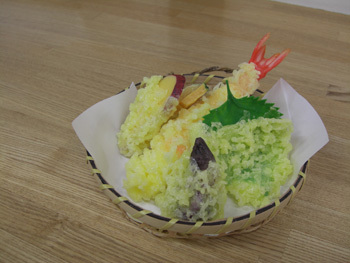 Food samples made with plastic in Gujo Hachiman look just so real. At some food sample factories (Sample Village Iwasaki, Sample Kobo, Asahi Sample Kobo), visitors can try their hand at making food samples. 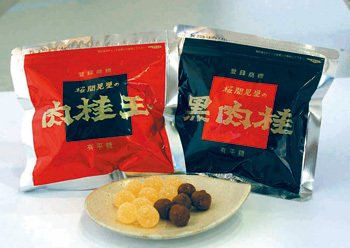 Gujo Hachiman has long produced simple sweets using cinnamon (nikki). Try a traditional sweet taste of Japan. 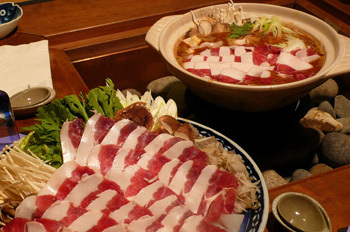 Wild boar hot pot (aka Botan-nabe) is a specialty of the winter season. Wild boar meat is cooked in a tasty miso soup. The pure waters of the Yoshida and Nagara Rivers is a treasure house of tasty river fish such as ayu (sweet fish), amago or satsuki masu (trout). Savor seasonal river fish from Gujo Hachiman. Simple yet nostalgic cracker. 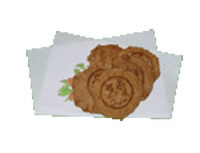 Every cracker with a nice fragrance of chestnut is baked by hand.